Concerning the photos and archive info we first see that great grandpa did indeed have a bike shop at Rozengracht 49 (and maybe also 40 though that’s disputable). It was called “Bergreijer” which is a play on words. Bergmeijer was the family name but “rij” is the first person form of “ride” or “drive” and “berg” also happens to mean “mountain” so in a punny sort of way it means “mountain rider”. The Dutch, incidentally, have a thing for funny names. Even when other countries were busy with dead-serious names and advertising the Dutch were naming companies with puns and other humorous approaches. It’s a history that goes back at least to when Napoleon became ruler of the region in 1810 and forced everybody to take on a family name which wasn’t at all universal at that time. Either out of spite for their ruler or figuring the names would disappear along with the ruler many people cose silly names. I actually know people who’s names directly translate to “Fountain pen”, “Short knees” and “Born naked”… seven generations later. Napoleon’s bones must be laughing in his grave. This week Herbert Kuner of the excellent rijwiel.net website sent a couple emails to Oscar chock full of additional information. Kuner found a Bergreijer advertisement in a 1919 trade magazine listing also a separate factory at Laurierstraat 134-142. This is around the corner from the Rozengracht 49 and presumably the factory location was just for production since I don’t think the Laurierstraat was ever a street for retail shops. There are still a number of light industrial outfits there, for example our offset printing firm a few doors down from where Bergreijer stood. This location is also not listed in the 1915 phone book, which inexplicably we both found digitized on the Internet. Another picture, though shows yet another bike shop called J. Cruiming right next to Bergreijer in the Rozengracht. Cruiming apparently also called themselves a bicycle factory and in fact a sign notes that their shop was not open to the public. This combination of retailer and fabricator is not so strange; many bike shops in this period made their own frames and other parts. I was able to find the same buildings in Google Street View. The two buildings in the right of the photo are essentially unchanged but the facades of numbers 49 (Bergreijer) and 51 (Cruimer) have unfortunately been changed. The photos include a number of bikes, most of them fairly standard models for this period. Inside the shop are two rows of bikes, many of them with rod-operated rim brakes and none with lights fitted. A carbide lamp fitted to the bracket at the top of the headset was the standard nighttime solution then though none are visible here. Barely visible in the lower right corner seems to be a child sized bike. There’s a gentleman in uniform, I’m guessing police though I suppose it could also be military or some other official function in which case he was very happy that the Netherlands remained neutral in WWI. His bike has a front fender that ends behind the fork crown as was the practice then. 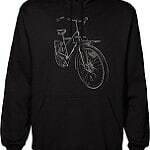 It’s a fixed gear since I see no sign of either hand brakes or even a reaction arm for a coaster brake. The chainring is a work of art and we can see it since none of the bikes in the photos have any kind of chain covers. Apparently the enclosed chain case became a defining feature of the Dutch bike later on. Here’s a rather dashing fellow looking ready for the start of the next Portland Tweed Ride or other costume themed bicycle gathering. I’m guessing he’s physically challenged since his stylish tricycle is hand driven through a very simple pair of levers that also serve to steer the machine. It looks like it would ride fine in a fairly straight line but sharp turns could be difficult, especially for somebody who’s partially paralyzed… or maybe that’s not really the purpose of this trike. There aren’t many streets this wide bordering large rivers in Amsterdam so I’ll venture a guess that this photo was taken on the west side of the Amstel river. ***Correction: A sharp-eyed, bike loving friend of Herb Kuner in Amsterdam points out that the above and below pictures look like they were taken along the Nassaukade. Silly me! That’s right around the corner from my home and I didn’t recognize it. Of course it is about 100 years later, but still… This morning I looked more carefully while riding Pascal to his daycare center and sure enough I found a spot where the trees (aside from being much thicker) and buildings match the above photo. This is our first bakfiets of the bunch, and it’s a remarkably ornate one. Check out that laquered box, the beautiful ironwork that seems to support both the loooong leaf springs and the handlebar, and the carbide lamps missing from the bikes in the shop above. The bike almost looks like more of a showpiece than a utility vehicle but who knows what its function was: selling cakes or household goods perhaps? Whatever it carried wasn’t heavy given the light-duty leaf springs. 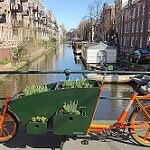 Though this is a very old bakfiets I’ve seen many pictures of similarly old bakfietsen from England and the Netherlands. 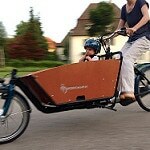 Nope, this is not the bakfiets Mr. Bergmeijer invented. Now, THESE last two are the bikes in question. They’re vaguely “Long John” type bikes from at least 20 years before anybody called them “Long John”. Actually they differ from Long Johns and all of the more modern variations in that the frame also runs above the load carrier along with the steering mechanism. 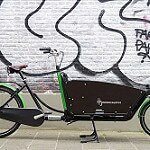 On Long Johns, van Andel’s Bakfiets.nl Cargobike and the legions of bicycles these two have inspired the front wheel is steered via a rod linkage below the load carrier. 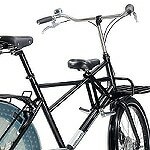 The two photos show two different versions o the Bergreijer transportfiets. 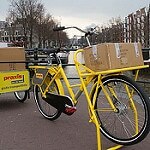 The photo with the delivery boy is probably an earlier model or prototype with no steering linkage; the handlebar has simply been extended back to reach the rider. The other bike with “G. Goes, Hemonystraat 18” (an address in Amsterdam) has a longer box and is steered via a rather complex system of bevel gears on a shaft. They seem to have gone from the simplest system possible to the most complicated… or maybe the other way around. 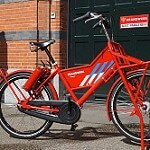 The bike is clearly marked “Bergreijer” and “Model D” along the top tube. I have seen a few other bikes that looked like these. One of them I almost purchased a few years ago but the owner decided not to sell it after all. This bike with its much more robust construction and dynamo lighting is much more recent, possibly from the 1930’s. The owner told me it was a Maxwell, a very well regarded Amsterdam builder of transport bikes, quite a few of whose big trikes still can still be on the streets. 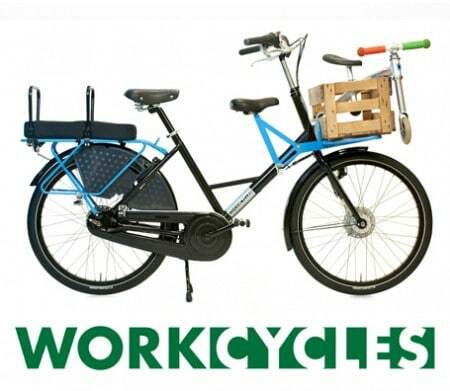 Another very similar (but still different) bike is displayed at a bike repair shop near Amsterdam Central Station. Looking more recent than the Bergreijer bikes but older than these two are these slick-looking Veeno’s shown on rijwiel.net. It is worth noting that ALL of the bikes described here are older than the 1938 I’ve seen proposed as the beginning of the Danish Long Johns, though I imagine somebody, somewhere in Denmark was also experimenting with long wheelbase transport bikes before then. 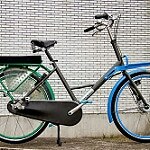 This repeating of history and reinventing of wheels I discussed earlier in “What’s really new in the bicycle world?”. 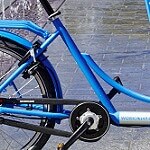 So did the Bergmeijer brothers invent this type of bike? It’s possible and their “Long Johns” are the oldest I’ve seen yet. However I’m only a dabbler in antique bikes and this was a time of incredible innovation and experimentation with bicycles (and cars, motorcycles and trucks too). There were several thousand little bike companies throughout the country so quite likely somebody else was also working on such bikes as well. Some day somebody else’s grandmother might pull a few worn photos of even older examples from a shoe box. For now though, I think it’s safe to say we’re at least approaching the beginnings of the Long John type bike. Does anybody have any more good clues to help fill in the puzzle? 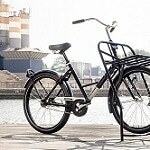 This entry was posted on Monday, February 22nd, 2010 at 09:00	and is filed under Antique/old bikes and history, WorkCycles dealers. You can follow any responses to this entry through the RSS 2.0 feed.You can skip to the end and leave a response. Pinging is currently not allowed. I can’t say anything about the bikes, but if you look at the photo of the shop interior the floormat – or whatever it is – says Gebr. Bergrijer (so not Bergreijer) at Rozengracht 40. The -rijer part would fit in neatly with the pun part of the name but I think it’s just a variation of Bergmeijer. The entry in the 1915 telephone book isn’t conclusive either as this is not the original; it has been transcribed and contains a lot of typos (just look the page over). On the other hand the brand name on the bike is clearly Bergreijer. Confusing! Related to the hairdresser Bergmeijer on the Damrak? The ornate bakfiets looks like the one my father made for me in the 1940s, on a smaller scale as I was a little boy then (from 1939). He told me these were bakers’ delivery bikes. I suppose I didn’t really appreciate the work he put into it as the bike was gone a few years later and I never asked. As for the Van Vulpen people: fountain pens weren’t around yet in 1810. Well, maybe a few very early prototypes on the desks of inventors but no usable pens in sight yet. Vulpen, or Fulpen, probably was a village somewhere south of the Rhine; I haven’t been able to find it, yet. You forgot to mention Jan Piest, in the same category as the ever returning joke of our Latin teacher who used to tell his first graders on their introduction to Latin that this was a less awe inducing language than they might expect, as it had phrases like “piscis nat”. Read it aloud and agree. Frits, I suspect they played around with “Bergreijer” and “Bergrijer” the first being closer to their actual name and the second being more literal. Of course they’re pronounced almost the same (especially in plat Jordanese which I’m sure these folks spoke) and the typical level of literacy might also have been lower then, at least in this working class neighborhood. I don’t know when the van Vulpen family took that name on but yes, probably not after the invention of the fountain pen. It is indeed probably a bastardization of a place name… but still funny new. Frits, Sorry, I forgot to add in my last response that Oscar was told by his family that they intentionally called the company “Bergreijer” instead of the family name “…meijer”. The stuff written on the “floormat seems to be added to the image later… proto-photoshop we could call it. thanks so much for this wonderful summary! I’m a sucker for history, so these kinds of posts are always fun. That fancy bakfiets with the big leaf springs almost looks like it could be a child-sized hearse or something. Mooi verhaal en prachtige foto’s! Dank je wel Bas! Het was gewoon leuk om te onderzoeken. The bike with the springs… as suggested perhaps a hearse for a child… or a pet (for departed creatures of wealthy people). Or some fine candies. But also I notice that it is the only bike here which is low step-over (so for a woman) or is that necessary for this type of three-wheeler? A woman-owned logistics company for confections and dead little ones. Would be nice to see Femke Halsema on one of these instead of in a hybrid car in the next election, which I think is happening sooner than expected? Back then these bikes were really only used by businesses, generally ridden by the son of the baker, butcher etc to do the deliveries. 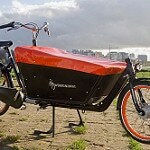 The trike has a low instep frame just for technical reasons: the box has to swing over the frame. A few of the old transportfietsen were built with step-through frames, but that was just to make them more convenient to ride and step over when heavily loaded… by men. Sure, the HIStory of cycling — written by men. No, just kidding. Curious to know when women there started carrying kids in cargo bikes. I suppose it would have been when someone put a seat inside the van Andel bike, indeed was this part of the original design OR more of a Reese’s peanut butter cup kind of moment? 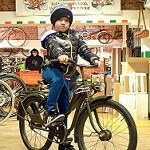 Aside from the occasional wife of the bakfiets builder women began carrying kids in three-wheeled bakfietsen when Christiania began making little, family oriented bakfietsen in Denmark, probably in the early 1980’s. These were always three wheelers. Van Andel’s two wheeled Cargobike was an improvement on these, and everything needed or family transport was present right from the first models: seats, harnesses, canopy, low step-through frame, stable parking stand etc. This was no accidental discovery; It was the whole point of the bike from its conception. That’s why I’ve steadfastly referred to van Andel as the spiritual godfather of this type of bike. Point is, in those early days, many may have come up with similar ideas. It is not a lesser feat to reach Mt Everest as the second person. But it doesn’t necessarily matter that you’re not the first or even the thousandth to think of something and possibly document it. You can still be the first to do something useful with it, or the first to see its importance for a new application. In such cases it might be much more difficult to patent the idea but there are actually quite few things that are worth patenting… especially in a field where practically technical permutatation has been tried or published once. I’m sorry not to add much to this discussion, but this post is one of the most meaningful additions to my sales pitch here in Los Angeles. 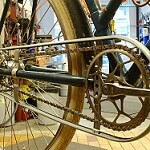 People get very distracted with “high tech” bike components on sporting bicycles – forgetting that so much refining and re-working of the bicycle has already been done. While reading this highly interesting piece, the radio (BNR) mentioned beick.nl in a column by some IT/web guy. I just can’t be bothered to open up my e-mail program and send you an e-mail direct. Sorry for the topic drift. Anyway, just my effort to keep you up to speed. No pun intended. 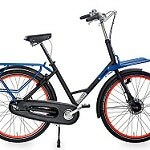 Just looked at the “beick” Interesting bike chooser web app for an otherwise uninteresting bike. I’ve often wondered why the fenders have to extend so far forward and I have run them to the crown or just forward on some of my recreational bikes. Some water and grit does fly off onto the head tube and headset but not so much. It’s probably mostly just the way it’s done now. That piece of fender probably weighs almost 30g!… about the same as the grime that flies off the top of your tire and lands on the bike. If you’re trying to reduce weight I’d recommend helium in the tires. It’s much lighter than Nitrogen and you have refill it frequently causing you to lose a little weight too. We joke about the weight savings, but try telling Rasmussen that. I heard he does a thread/turn count on the bolts in his bikes and trims down the excess length. That should save about 30g a bike! Which seems stupid, when the UCI has a minimum bike weight rule…..
Nitrogen is better than Helium then and better than air! And easier to come by, as 78% of air is nitrogen is anyway. It’s that 28& other gases that really make the tire filling heavy. I agree though, a full fender looks better. Henry, how would grit that flies from the top of your tire land on your bike? If you are thinking the grit that flies up and whilst moving forward just happens to land exactly on your bike again, then I would dispute the 30gr and say it’s far less….